What Did Roc Nation Buy for Rihanna? It really must be nice to be Rihanna and it must be even nicer to be signed to Roc Nation. This past weekend Rihanna showed off her brand new ride, a Jeep Wrangler. 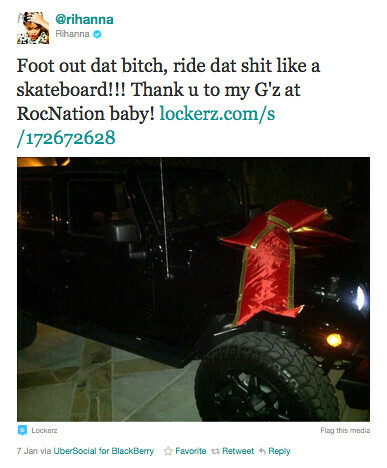 The vehicle, which is black on black, was given to the singer as a gift from her Roc Nation record label. If anyone deserves a gift, it is Rihanna. The singer not only held down the 100+ show 'Loud' tour this year, she struck gold with her recent album, Talk That Talk.